India being a peninsular country we have seen the beauty and glory of the ocean carefully enough. 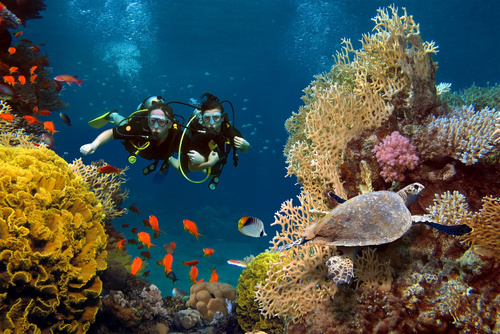 Scuba Diving is becoming famous day by day in India, and there are so many places coming up. But as it is rightly said that, “Everything has a right time and place.” Owing to the varied visibility of the Indian waters you have to be discrete while choosing the diving site. And so we are here to help out with a list of 5 places that you must travel for scuba diving in India each sharing different mysteries from the underworld. Undoubtedly the first on our list are these set of little volcanic islands floating in the Bay of Bengal that is nothing less than paradise with mesmerising blue waters and shiny silvery white sand. Beholding most vivacious and enticing marine life the islands are the ultimate hub for scuba diving in India. There are several diving sites that host recreational diving for beginners and professionals. They have training courses also for those who wish to take their hobby a step ahead. Water visibility is just perfect allowing one to spot particular sea species from turtles to sea dugongs dwelling amongst colourful coral reefs. The dive is absolutely enchanting when the beams of sun’s light puncture through the blue waters and unravel all the colours beneath. The experience is just too surreal. You could associate with diving organisation beforehand or directly contact the local Diving resorts. Best Time- March to May. ● In Havelock Islands-Lighthouse, Barracuda City, Mac Point, Aquarium. ● In Neil Islands-K Rock, Margherita’s Mischief. ● In Port Blair -Mahatma Gandhi Marine National Park. Average Price: CAD 100 – CAD 200. For those with the Discover’s gene, there is a particular kind of Scuba Diving called the Wreck diving that allows you to explore the sunken ships wrecks of the past. This type of diving requires a little higher level of expertise. Amongst very few wreck diving sites in India is the Princess Royal Shipwreck at Bangaram Island in Lakshadweep. The site that lies 54m deep is now a home to an old British warship sunken by the French Navy. Resting in peace for 200 years on the ocean bed it is now a safe haven for the sea dwellers. The ship calls out to you lying majestically still fairly intact and in good shape in its former copper hull. One can spot its canons and a huge anchor at a depth of 40m along with several other vessels and artefacts. Nothing can be retrieved from the site as per the laws. Best Time- October to March. Other Sites -Lakshadweep has other spectacular sites from scuba diving such as The Grand Canyon, Little Canyon, Manta Point and the Bangaram Lagoon. Average Price: CAD 80 – CAD 150. The Gulf of Kutch obscures from us the mythical city where Lord Krishna once lived. The legend says that when Lord Krishna the founder of the town died, the sea came to bury it within its dark waters. After which it was built and destroyed for seven times at the same place. The Archeological Survey of India has procured several pieces of evidence that suggest of a sunken city dating back to 7000 years. To unravel the glories of this sunken city divers are tempted from all over. Scuba diving is undertaken at Bet Dwarka a small island off the central city. There are frequent boats from mainland taking you to this beauty struck Island for your marine sprawl. During your dive don’t just expect remains of the ancient city for it also treasures amazing rainbow coloured coral reefs and marine life. Low tides are ideal for spotting Dolphins, Pufferfishes, Seahorses, turtles and octopuses. Average Price: CAD 120 – CAD 150. Tarkarli, a rather secluded coastal village in Sindhudurg district of Maharashtra, is still free from clenches of commercialisation, unlike Goa. Its beaches still preserve their innocent captivating charm with white sands merging effortlessly with clear azure waters. But that is not all; it holds even more alluring beauties under its deep waters. Be it the vibrant coral reefs or striking marine species or mysteries wrecks and caves you will see it all on your deep sea expedition. The Sindhudurg fort is the most popular site for diving. There are glass bottom boats available from the Dandi beach to fort site that lets you get acquainted with the marine life on the way. Occasionally you can spot springing dolphins on your way. Best Time- November to March. Average Price: CAD 30 – CAD 120. Popularly known as the Pigeon Island; this tranquil Island is 19 km from Murudeshwar in Karnataka and is perfect for recreational scuba diving. There are a couple of diving sites ranging from 10m to 30m deep that are absolute visual treat laden with the colourful coral seabed and exotic marine species. The adventurous dive in these clear tropical waters last for 30 minutes that unleashes a plethora of sea creatures just as amazed as you are when you visit. You will be like a floating giant amongst these tiny playful schools of parrotfish, triggerfish, turtles, stingrays with whale sharks and killer whales. Best Time- October to May. Average Price: CAD 100 – CAD 160. We hope to have motivated you all enough to go on a deep sea voyage. So dive and discover by yourself the world beneath; it is full of astonishing surprises. Tags : Scuba diving in India . Best places for scuba diving in India.